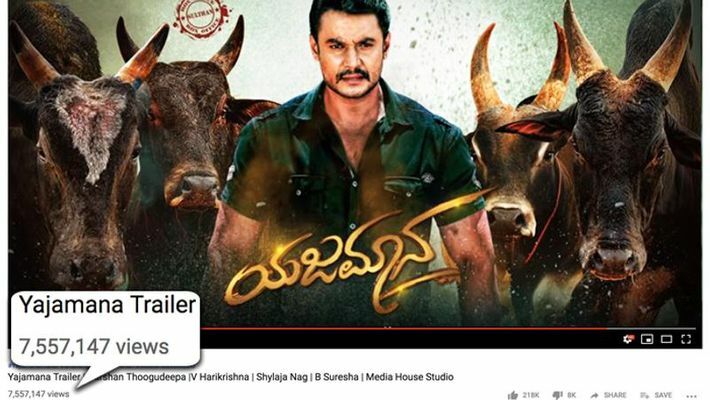 Bengaluru: Challenging Star Darshan's Yajamana is taking online media platform YouTube by storm as the film's teaser has crossed over seven million views in just 24 hours. According to the movie’s producer, Shylaja Nag, to make a film success, what all the elements are needed have been included. "Darshan being a mass hero, the female lead, Rashmika Mandanna who is most searched film actress in the south these days on Google, is part of the film and Tanya Hope has also been roped in. Thakur Anoop Singh of Singam fame, Ravi Shankar and Dhananjaya are the villains. The talented music composer V Harikrishna will make his directorial debut with this film. We have selected March 1 as the release date," Shylaja told Newsable. Director Harikrishna, who is said to be in Chennai for fine-tuning the movie before its release, said he has put over one and half years of efforts and made the film keeping the fans and people’s expectations. "The film is about 2.42 hour long and has five songs. The film was shot in Mysuru, Mangaluru, Chikkamagaluru, Mumbai, Dubai and Sweden. Despite being a big star and busy schedules, Darshan Sir's availability was never a concern for us. He is one of the most cooperative artists," said Harikrishna. According to film sources, the movie's teaser was released on February 9 and it crossed seven million views in 24 hours and still continues to attract more viewers.